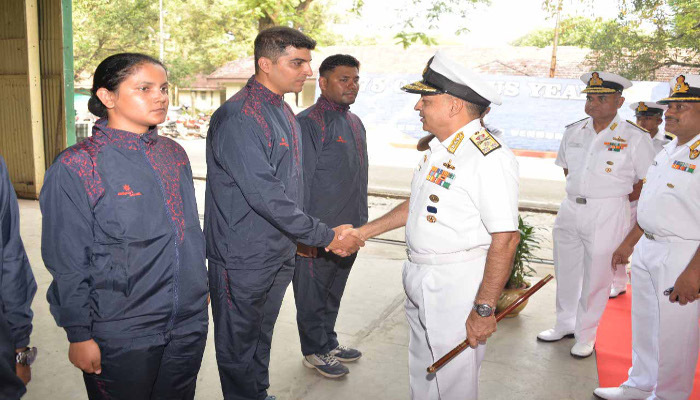 The ten member team from Sourhern Naval Command which undertook the maiden mountaineering expedition to Mt Menthosa (6443 mtrs) returned to Kochi successfully on 29 October 2018 The expedition team was received by Vice Admiral Anil Kumar Chawla, AVSM, NM, VSM, the Flag Officer Commanding-in-Chief, Southern Naval Command. The team had unfurled the tricolour as well as the naval ensign atop Mt Menthosa on 16 October 2018, after successfully summiting it. 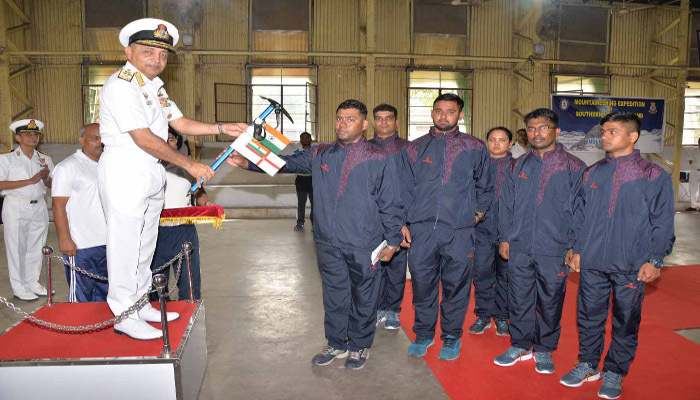 The expedition team led by Lt Cdr Shivesh Kumar Sanam comprised of three officers and seven sailors from diffrerent units of the Southern Naval Command. 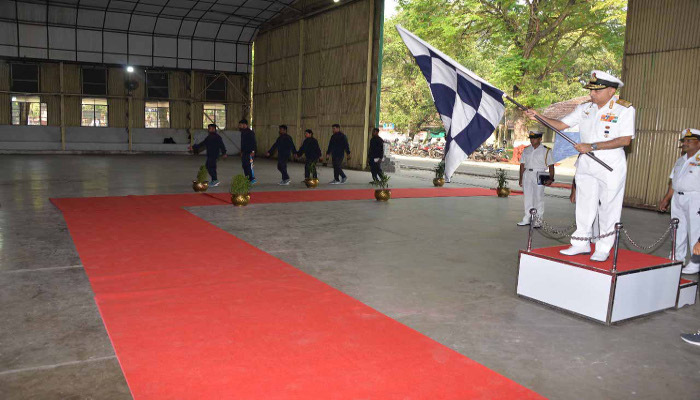 The Flag-in ceremony marked the formal culmination of the expedition, with the team leader returning the ceremonial ice axe and naval ensign to the FOC-in-C that were handed over during flag off. The Admiral congratulated the team on its success and said that all members had shown great courage and determination in overcoming the adverse terrain and extreme weather conditions. The team members were thereafter felicitated by award of mementoes and certificates of proficiency by the C-in-C. Prior to embarking on the expedition, the team spent a brief time at IMF, New Delhi to sharpen their mountaineering and climbing skills and their physical conditioning. The actual climb which started from Urgos village, in the Lahul Spiti region of Himachal Pradesh tested the preparedness, courage, perseverance and toughness of the team members. The team had set up four camps enroute to the summit. Acclimatisation at each stage, physical fitness, mental strength and and team work were critical to the success of the expedition. The local weather conditions, extremely low temperatures (-25°C), soft snow conditions and wind speeds of the order of 20 knots were the challenges that made the initial progress slow. On 11 October 2018 after having spent two days at Base Camp, when the team was informed of expected bad weather between 16 and 19 October 2018, they decided to make use of the available weather window and climbed from Camp 1 to Camp 3 without halt/ rest. On reaching Camp 3, the team started its summit attempt at 0200 hrs on 16 October 2018 to take advantage of the hardened snow. From the summit camp, it took a little over eight hours for the entire team of 10 members to reach the summit, which they accomplished by 1030 hrs, displaying grit and determination in the face of some extreme conditions. The team returned back to Urgos village over the next three days. The team members comprised Lieutenant Commanders Shivesh Kumar Sanam, Sahil Verma, Neelam Kandpal, Mahesh Kumar POME, Bhaskar Pal POPTI, Vysakh KS LMA, Abhishek Inge LS(SD), OD Sharma LS(GW), Praveen Sardar L COM and Sagar Salunkhe MA I.